For five weeks starting December 1, the great Faerie Drink site will be hosting live author chats with a wonderful line-up of authors. I'll be dropping by every day the week of December 15-22 to chat and answer questions. Holly Black fans, look for her Dec 22-29! See the whole list of authors below. To participate, go to the Faerie Drink Forums, register, and then go to Author Chat. And check out the site, too; there's tons of inside scoop about the Spiderwick movie (CAN'T WAIT!) and other Hollytastic projects in the works. Wait — you're saying you never got the question? You didn't know about the contest? You think you coulda been a contender, if only given half a chance, so what gives? Yikes, people. That means you never signed up for my author newsletter! What are you waiting for, the Tony Awards? Nudge your eyeballs over to the right a wee bit — see where it says to put in your email address? Do that, and you'll get an email asking you to confirm your subscription. Do that, and you'll be on my list. Then, maybe four or so times a year, you'll get a brief emailed author newsletter from me. In it you will find the quizzes, the contests, the book giveaways, and the merry musings that you are now somehow surviving without. In the meantime, congrats to the winners! The books are in the mail. p.s. 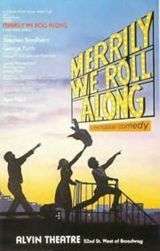 — *the correct answer is, of course, Merrily We Roll Along.